On this day we celebrate the great discovery of Christopher Columbus - America. So, of course, I feel I must post some obscure facts about the man, his family, and his discovery. First off, I know that by all the school books you've ever read, you were led to believe that Columbus' journey was a well planned venture of discovery by the British empire to find a new world. In reality, that didn't happen until later. You see, Christopher Columbus was actually charged with finding a sea route to India. He thought it would be quicker to use the an ocean route, therefore, hastening Spain's entry into the lucrative business of spice trading. Only thing is, when he finally gained approval (and funding) from his country's leadership, he launched quickly in fear they would change their minds. He landed in the New World months later and immediately set sail back home to tell his country he had found passage to India. I'm sure that most of you know this fact. I write this not to discredit the great achievements of this person but to express how every story can make for a great novel or movie. The association that most school students are given is that Christopher Columbus was somehow tied exclusively to the Mayflower and the first settlers of America. 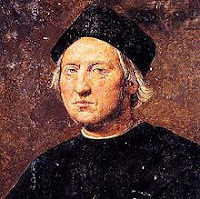 In fact, Christopher Columbus' fleet consisted of the Nina, Pinta, and Santa Maria. The Mayflower came later, after Europe discovered that Columbus did not find a new route to India but a new land. Of course in the true spirit of the British Empire, they did not send their great explorers to the new world. They sent their religious zealots, criminals, and endentured servants, just like Australia. But I digress, let me get back to Chris. I can only imagine the agony he must have felt when he realized his gross navigational error (he greatly underestimated the distance to India) but his elation when he found that, purely by mistake, he'd discovered a new land - well, kinda. Actually America was first discovered, and settled, by Leif Erikson, a Nordic Explorer, nearly 500 years before the landing of Columbus. The difference is that, in the case of the latter discovery, the British Empire took advantage of the information economically and strategically. If Spain would have been just a little quicker on the uptake, we would all be speaking spanish today. I guess the main point of this rant is that history can be fun. And, if one digs deep enough, true historical events can provide excellent fodder for story creation and story telling. Oh, and by the way, did you know that Columbus' wife, Filipa, died in 1485 from "Consumption?" Think about the fictionalized story implications of that. Consumption? As in - someone ate her? I can only assume that by consumption, the historians meant to say that she suffered from alcoholism or she overate and died of something related to morbid obesity. The date of his second child's birth (a daughter) was listed as after the death of his wife. I suspect that either the date is incorrect or he had a mistress. I don't know what school you all went to...but we learned Colombus sailed for Spain under Ferdinand and Isabella. I'm also getting worried about our children's education! I never heard the connection with the Mayflower, incorrect as it is. Wow, I learn so much from Blogging. SOme of this I knew but I love to learn from what crazy people I've come from.